"Just for Fun" agility focuses on FUN! Fun with jumps, tunnels, tables, A-frame and weave poles. This session is a great introduction to Dog Agility so you can see how much fun your dog will have and test their suitability for this fun and fast sport. Your dog will be happy and exhausted after this lesson. Your dog must be well socialized and good around other dogs. This session is for handlers and dogs that have been through The DogSmith’s Just for Fun Agility class or that have prior agility training. These one-hour classes are designed with a course that will help dogs and handlers practice their agility skills and prepare for competition. Your dog will be happy and exhausted after this lesson. Your dog must be well socialized and good around other dogs. Prove to your friends and family just how polite your pooch can be by earning your AKC "Canine Good Citizen"™ Certificate. The AKC's Canine Good Citizen™ Program is designed to recognize dogs who have good manners at home and in the community. This rapidly growing nationally recognized program stresses responsible dog ownership for owners and basic training and good manners for dogs. 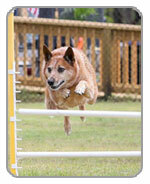 All dogs who pass the 10 step CGC test qualify to receive a certificate of recognition from the American Kennel Club. The AKC CGC may qualify for a reduction in homeowner’s insurance in some areas. *Free community seminars at local rescue facilities. We strongly encourage donation to the rescue.